At Mermaid’s Garden in Brooklyn, since December 2013 husband-and-wife owners Bianca Piccillo and Mark Usewicz have run the only stand-alone, exclusively sustainable seafood shop in the country. At Mermaid’s Garden in Brooklyn, since December 2013 husband-and-wife owners Bianca Piccillo and Mark Usewicz have run the only stand-alone, exclusively sustainable seafood shop in the country. Usewicz trained as a chef at La Varenne in France and other restaurants. Piccillo has a degree in biology with an emphasis on fish biology, or ichthyology. Together they sell no farmed salmon, no farmed shrimp, just whatever in-season shell- and fin fish they can get from fishermen they trust (plus prepared foods to go with the fish). 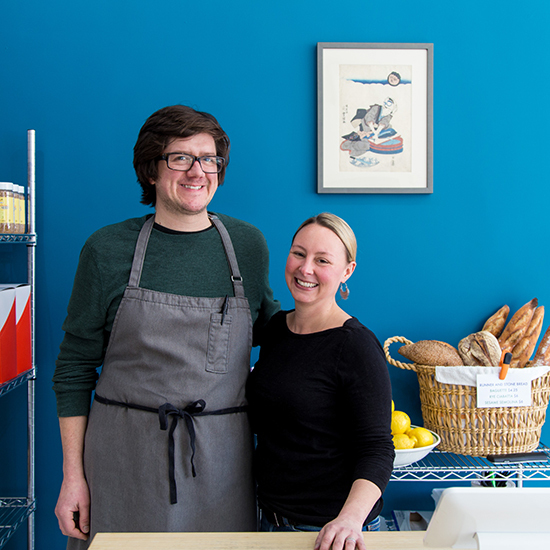 Their storefront was partly crowdfunded, with heavy support from the membership list of their community-supported fishery (CSF), which they launched in June 2012. When they completed their Kickstarter campaign, in October 2013 they exceeded their goal by 20 percent, raising more than $18,000. Here, Piccillo shares how they did it. When did you first get the idea to open a seafood business? A few years after we moved to New York from Boston, in about 2008, we started writing the business plan. Our original idea was a storefront. Mark’s a chef, and I have a degree in biology. I started studying ichthyology, which is fish biology, when I was 16. So we had a pretty good idea of the kind of seafood we wanted but we were not able to find it very easily. We’d always thought we’d open a restaurant, but a seafood shop seemed more necessary. Brooklyn doesn’t exactly need another restaurant, but there are no other fully sustainable retail seafood markets in the United States that I know of. I don’t think there are a lot of ichthyologist-chef combo couples, either. Because we have this really weird skill set, we thought, if anyone can do it, it’s us. We just couldn’t find the right space. How did you start your CSF? We had found fishermen willing to work with us. A Brooklyn blog asked if people would be interested in a CSF, and linked to a survey we set up. We got more than 500 responses. We collected all this data about price points, logistics, where the need was the greatest, what people wanted. Then our friends who owned Palo Santo offered to let us run it from their restaurant. We built the software program, then opened it up to subscribers and crossed our fingers. That was in June 2012. Within six weeks we had 80 subscribers. Now we’ve got more than 350. How did you find the retail space? After Hurricane Sandy, after seeing so many proprietors cut off from their businesses, we wanted something within walking distance from our home. It took two years of looking, but we finally found a shelled-out former Chinese takeout restaurant less than a mile from our apartment. Initially, we approached banks. But even if you have the most brilliant idea and upstanding business, if you haven’t been in business for at least three years, they don’t want to talk to you. Mostly we used money we’d saved. We just used Kickstarter as a top-off. This business is for the community, so we thought maybe the community would want to take part. We looked at other platforms, but because we have CSF members who worked for Kickstarter, it seemed more of a community thing to do. We reached out to CSF subscribers. We also have a mailing list we’ve been compiling ever since we launched that survey. We got some love from Edible Brooklyn. We got a big initial hit, and then there was kind of a lull. Friends who’d run successful campaigns told us to keep reminding people, and to remind them again. And again. I don’t think we would have succeeded if we hadn’t been as assiduous as we were. You started your business planning to open a storefront, but ended up with a CSF. Now that you have the storefront, are you glad you started the CSF first? If we did not have the income from the CSF, opening this place would have been impossible. Having that extra income stream is such a reassurance in the middle of the night, when you wake up and think, Oh my God, what have I done?